You can use the Adjust and Halloween Tabs to customize your picture. 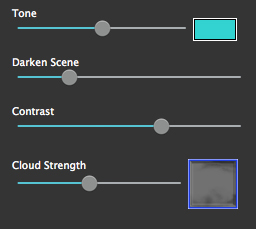 Tone - Choose a tone to add to your image with the color box and use the slider to change the opacity. Darken Scene - Darkens the image giving it a dark and 'spooky' look. Contrast - Change the difference between the lightest and darkest parts of the image. Cloud Strength - Change the opacity of the cloud/ rain on your image. Use the thumbnail to select a cloud to use on your image. 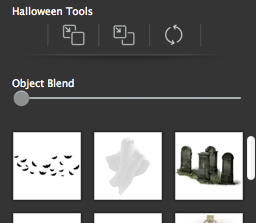 Object Blend - Change how much the Halloween Objects blend into your image. Halloween Stuff Thumbnail - Choose a Halloween object to use on your image.